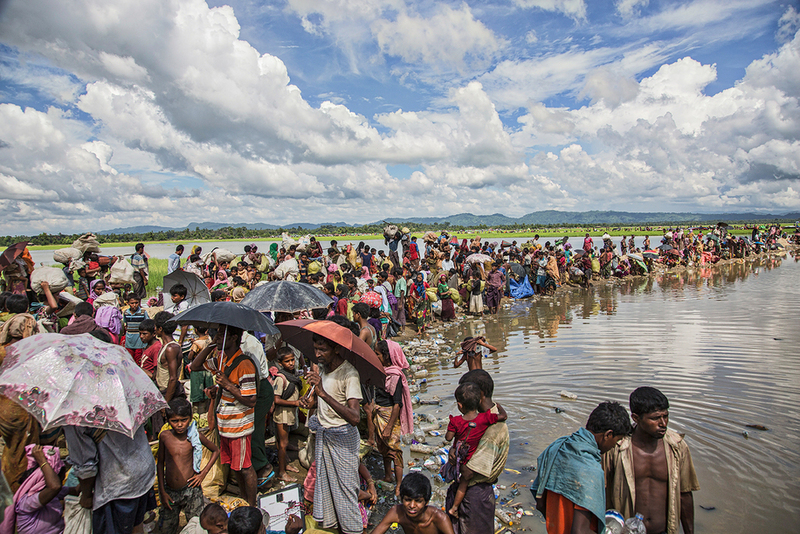 More than 15.000 Rohingya, after crossed border between Myanmar and Bangladesh, waiting their turn to receive food and medicine on small tongues of sand in the ricefields. After they will be send in a refugee camp. Another genocide of our time, with many witness, but few concrete international actions to stop the violence. 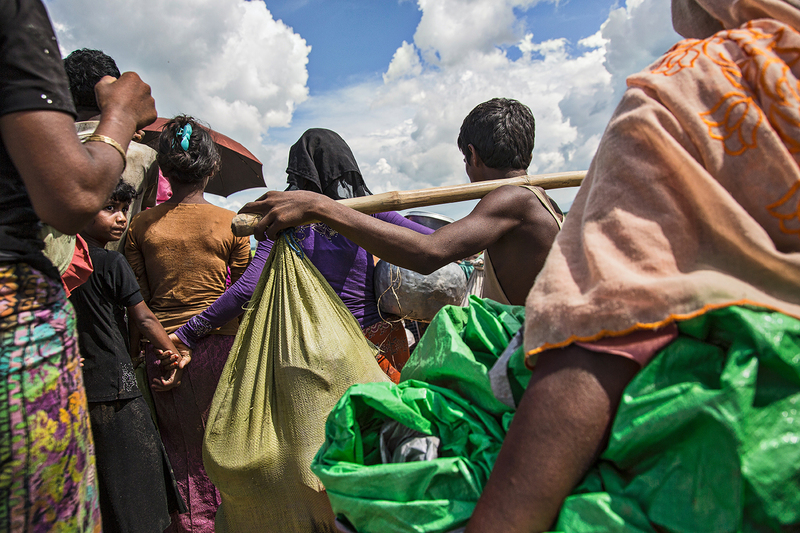 Rohingya's exodus goes on, under the indifference of the rest of the world. Rohingya are a Muslim minority living in north Rakhine region, a small state of Myanmar which lies along the border with Bangladesh. 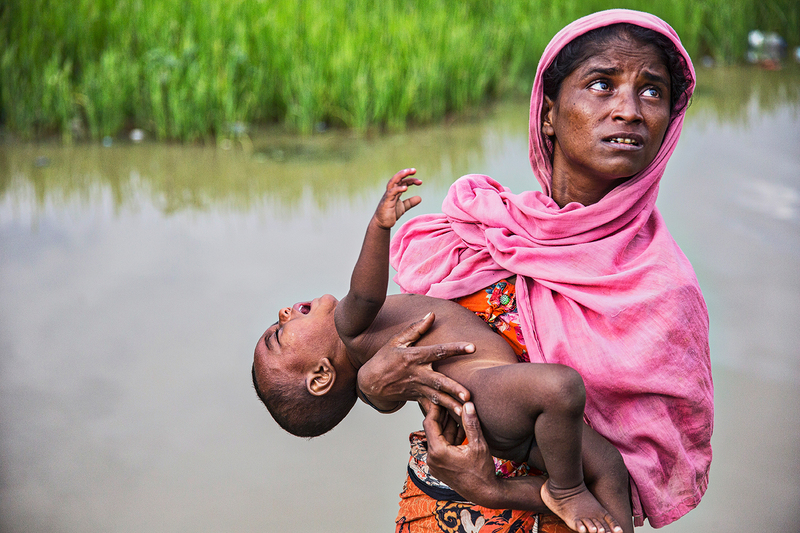 The darker skin of Rohingya, compared to most of the Burmese population has provide scope for racist attitudes and discrimination. Also religion is used by military of Myanmar to justify their aims. 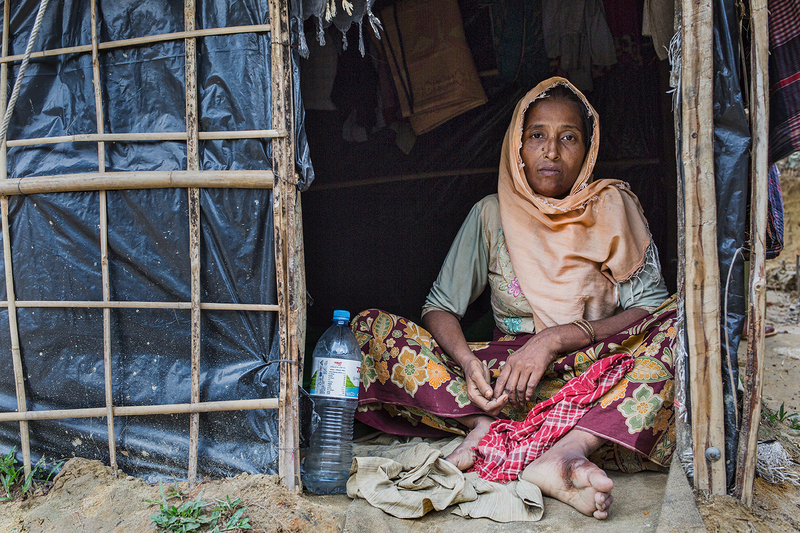 Religion and ethnicity are only part of what explains this forced displacement: Rohingya were denied citizenship of Myanmar by a law enacted by its military government, so reducing their status to that of a stateless group. Soldiers wants the complete control of entire country's land for new forms of economies, mining, timber, geothermal energy, with new foreign partnerships. Since october 2016, more than 900.000 people arrived in Bangladesh, crossing the border at rice fields of Palangkhali. 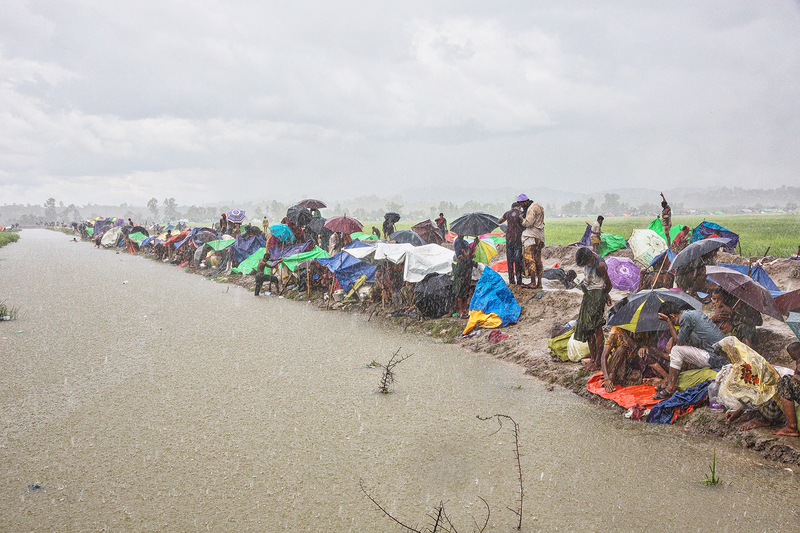 Bangladesh, Cox's Baxar, Palangkhali's area, Cox's Bazar, Bangladesh, October 2017 More than 15.000 Rohingya, after crossed border between Myanmar and Bangladesh, waiting their turn to receive food and medicine on small tongues of sand in the ricefields. After they will be send in a refugee camp. Rohingya travels with few things. Most of them are sick and destroyed after ten days walking in difficult conditions. 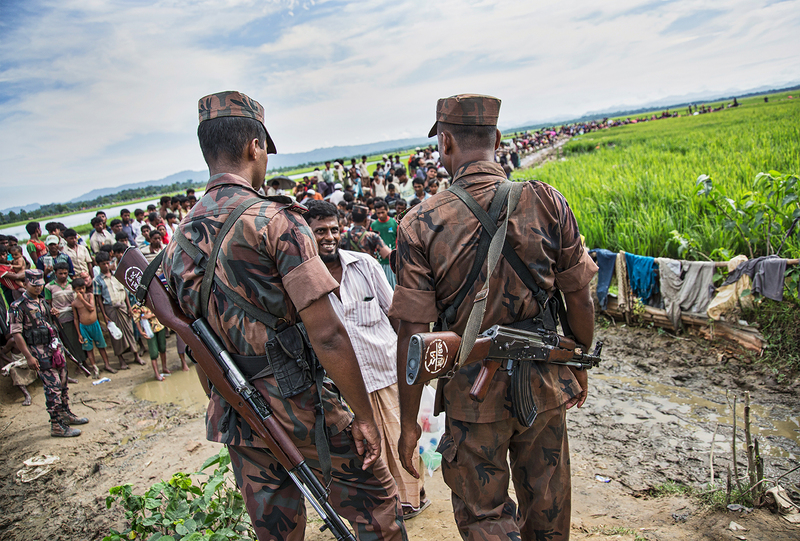 Border Guards Bangladesh ordering to stop to Rohingya refugee after they crossed the border between Myanmar and Bangladesh. Every hour just small group of people can go inside, receive food and medicine. This is decided for don't create dangerous situations. 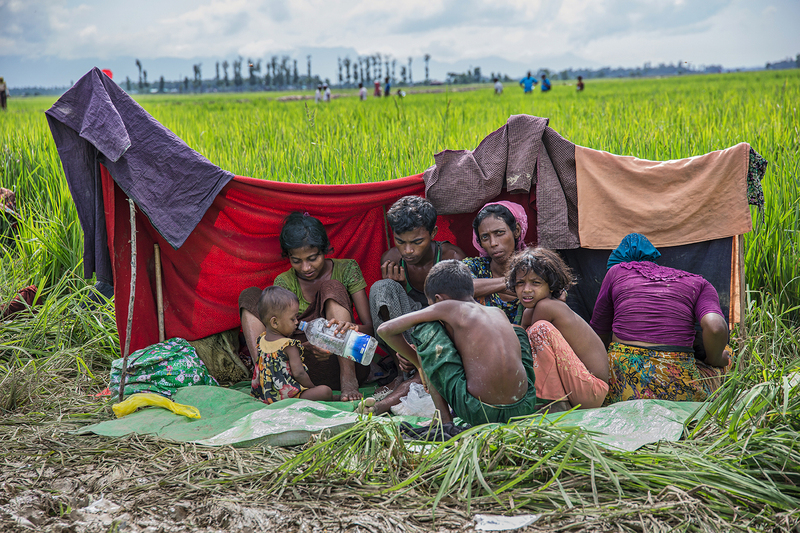 A Rohingya family take a rest in ricefield after ten days of walking between Myanmar and Bangladesh. A mother with her sick child. Most of children suffer of high fever, epidermis problems and dysentery. 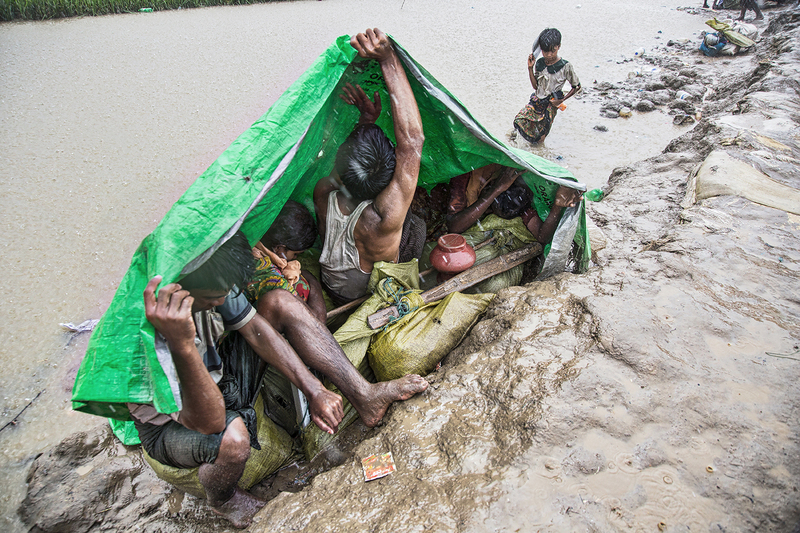 Refugees in the mud, waiting the end of a cold rainstorm. Under a rainstorm, tarps can offer a misery protection. 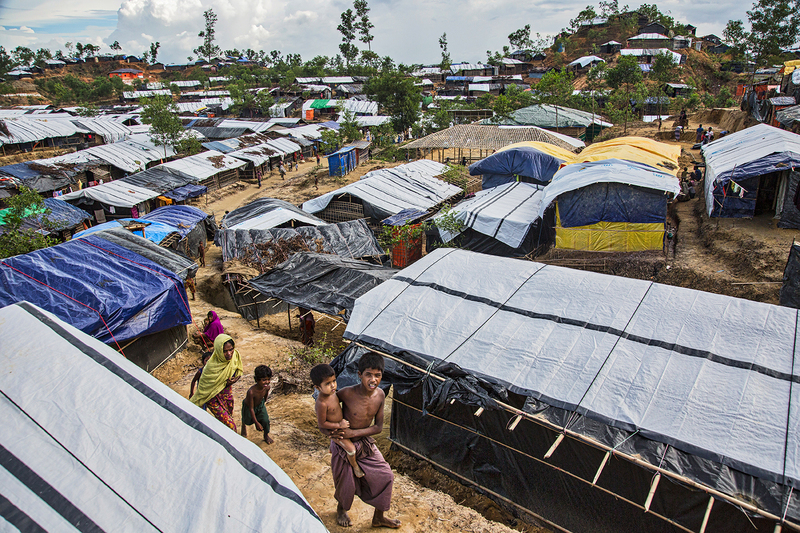 A view from the top of Balokhali, one of the biggest refugee camp in Cox's Bazar area. A view of a part of Balokhali refugee camp, one of the biggest in Bangladesh: developed on several hills, is large 8 kilometers. More than 150,000 people lives here. Mostapa Katun, 45 years old, shows her foot hurt by bullet in Myanmar. She escaped with other nine friends, but she doesn't have any news of 7 of them. She thinks they are dead before cross the border.